"The communication skills that you get from journalism really help in marketing. At the same time, the analytical skills I've gained in marketing, working in data and sets of numbers, has helped me approach my journalistic projects. To me, this 'crossover' aspect is a key advantage of the liberal arts." "One of my big deciding factors for choosing Miami was when I met Professors Richard Campbell and James Tobin. Dr. Campbell is the chair of the Department of Media, Journalism and Film (MJF), and Dr. Tobin is the faculty advisor for The Miami Student. I sat in on one of Professor Tobin's honors classes on narrative nonfiction, and then we talked about the journalism program and joining the newspaper. This is what decided it for me! Sitting in on the class and having that one-on-one time with a professor was great. "Although I've always loved writing, my high school didn't have a student paper, so I was a little nervous that I wasn't going to like journalistic writing. As it turned out, I loved it, right off the bat. I hit the ground running my first year at Miami by writing for The Miami Student, pretty much the first week! Towards the end of my freshman year I became an assistant news editor, so I was in the newsroom a lot and trying to write as many stories as possible. This year I've become the managing editor. 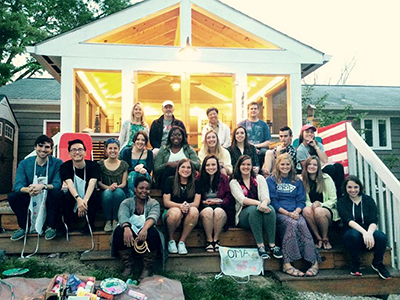 "During my first year I also joined Pi Sigma Epsilon, a business fraternity focused on marketing and sales. Doing this led me decide to choose marketing as my second major. In the fraternity, every new member completes a consulting project for a client, which I really enjoyed, so after that I added the marketing major. "Overall, I love that there are really great people here at Miami. Writing for the Student has made me understand this university more, often seeing behind the scenes, talking to different administrators and professors outside my degree program, talking to students that I never would have met if they weren't involved in a story. Doing all this has made me realize the great varieties of people in both the student body and among the faculty, and you don't necessarily get to see this if you just stay within your program." "Besides writing for the paper, there are a couple major experiences I've had at Miami that have left a positive and lasting impression. This past January I took a bus with other students and faculty to visit the Myaamia Tribe of Oklahoma for their 20th Annual Winter Gathering, which is full of cultural events. This trip, which was put together by Miami's Myaamia Center, gave me and James Steinbauer, our paper's current editor-in-chief, a great chance to gain a deeper understanding of the tribe. "We really enjoyed meeting members of the tribe and got to participate in everything, including the moccasin game and the telling of their winter stories. I wish more people knew about the Myaamia Tribe, because not many universities have this kind of relationship with an active Native American tribe. We're hoping to have a couple student editors go on this trip every year so that we always have a couple people on the staff who can understand the tribe fully enough to write stories about them. They're wonderful people, and more Miami students should get involved with the Myaamia Center! "Another noteworthy experience was visiting Cuba for MJF's one-week "Stories from Cuba" study abroad trip just this past June. It was incredible. Before this I'd actually never been outside of the country or even on a plane, so it felt a bit extreme that the first thing I did was go to Cuba. I don't even speak Spanish! However, you can't easily go to Cuba as a tourist right now, not yet, so I really wanted a once-in-a-lifetime kind of experience." 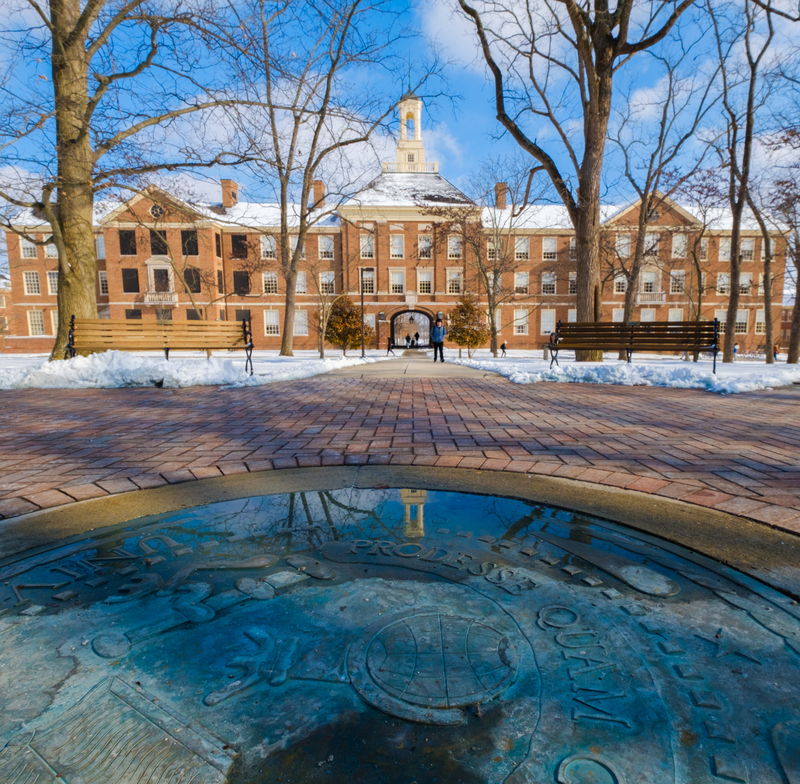 "I'm somebody who has always been interested in a lot of things, and I think that the liberal arts education that Miami provides is a great chance to explore a lot of different things at once. It gives you more of an open mind and a different perspective. 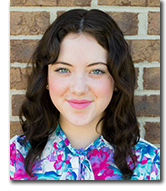 "Both my journalism and marketing majors are preparing me for a career. Even though I love all my classes, I feel that nothing can compare to just going out there and doing things myself. My involvement in Pi Sigma Epsilon gets me involved in marketing projects with actual clients. Doing that work has prepared me for the kind of work I'll actually be doing someday in the workplace. Although there are differences, my marketing and journalism skillsets cross over, especially in terms of writing. "Every new article I'm writing for my journalism classes and The Miami Student forces me to talk to a totally different set of people about something new, and I think it's an exciting challenge. The communication skills that you get from journalism really help in marketing. At the same time, the analytical skills I've gained in marketing, working in data and sets of numbers, has helped me approach my journalistic projects. To me, this 'crossover' aspect is a key advantage of the liberal arts." "I first learned about MJF's study abroad program to Cuba from Joe Sampson, a clinical faculty member in MJF, who approached me a year in advance. Despite my lack of travel experience outside the U.S., I realized that I'd never learned a lot about Cuba, beyond maybe the Cuban Missile Crisis, and as a student journalist I couldn't pass up the opportunity to go. "We spent a week before our trip learning about Cuban history and culture, and then our trip took place during the second week. Everyone had to contribute one news story to the "Storytellers in Cuba" website as well as a series of blog posts about our day-to-day activities on the island. It felt so different, like we were going back in time with the old cars — but we would also see some people using cell phones. Everyone we met was very excited to talk to us. 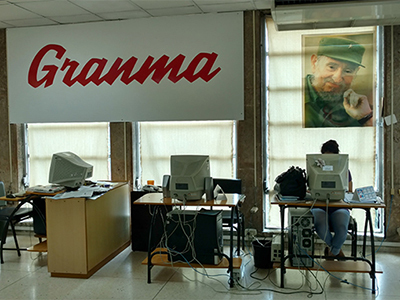 "One of the most interesting things we did was visit the offices of Granma, Cuba's national newspaper. Because it's a communist country, Granma is really one of their main news sources. It was amazing to go inside those offices, seeing computers that are decades old, in the quietest newsroom I've ever seen. We met the paper's head of the newsroom, Karina Marrón González, and I was surprised with how ambitious and devoted she was to improving the paper. Despite her restrictions, she spoke with us very openly and demonstrated that we have a lot in common. "We also visited Radio Havana and had various lectures from professors at the University of Havana. I learned so much about Cuba, realizing that although the U.S. is such a big part of their history, there's really so little I knew about them. "When we returned to the States, we spent a week working on our journalistic writing. My story from the trip was about Cuban coffee. This past April, coffee was named as one of the products that could be sold by Cuba to the U.S., and it's because coffee plants are owned by Cuban citizens, not the government. Part of my article presented a history of the Cuban coffee industry and Cuban coffee culture, and the rest of it examined how difficult it is to sell here, despite being recently cleared for importing to the U.S. After all, when Cuban farmers export their goods, they still have to go through their own government. "My article came out just around the time that Nestle, a Swiss company, announced that they were going to start selling Cuban coffee here in the U.S. for the first time. It was interesting timing!" Opening Minds Through Art (OMA) volunteers pose for a photo in front of OMA founder Dr. Elizabeth Lokon's house. "My biggest piece of advice is simple: write for the paper! Write for other things too, but if you're in journalism or another related field, you should really get involved with The Miami Student. Just write as much as possible. "I'm really glad that I went on the MJF department's first study abroad trip to Cuba. Don't be afraid to go somewhere that is very unfamiliar. As I mentioned, I don't speak Spanish, and I didn't meet a lot of people who spoke English on that trip. But I picked up a few phrases and just focused on saying those few phrases as well as I could. "My final piece of advice is to find a passion project. For me, that's volunteering with Opening Minds through Art (OMA) through the Scripps Gerontology Center, which I've been doing since my freshman year. We go to local nursing homes, partner with an elder resident with dementia, and do art projects together. Although OMA doesn't directly relate to my majors or professional aspirations, it's just something I love doing! "This is why I think it's really important to find something that inspires you. Find something that you're passionate about and really enjoy — something that doesn't have to go on your resume."